You’ll see this tie soon. Like any tribe, Wall Street has its own way of dressing, passed down from executives to managing directors, VPs to associates, and so on. It is a (mostly) classic style for a very hierarchical set, and as such it evolves quite slowly. But it does evolve. Sadly, some on Wall Street do not evolve with it. That is why we wrote this list, to make everyone aware of the things that have been left behind in the past, exactly where they belong. To do it, we talked to stylist Jessica Cadmus, of the Wardrobe Whisperer, who regularly cleanses the closets of bankers from coast to coast. “When I edit a wardrobe, I designate three classes of items: those that are still relevant, those on ‘probation,’ meaning that they are serviceable but my eye is on them for an imminent upgrade, and those that need to be burned,” she told Business Insider. Some of these picks were once staples but have gone out of style. Others are simply tired (as in we’re tired of looking at them). If you know someone who has these in his closet, help him see the light if you can. We begin with an iconic photo from an iconic movie (“Wall Street”) to honor the place suspenders had in Wall Street’s past, but also to remind you that it was made in 1987. It is now about to be 2017. The suspenders look dated now, and you (will) look dated in them. A very simple rule while watching “The Wolf of Wall Street” – never dress like anyone in the movie. Paisley ties are for the maître d’ at an Italian restaurant tourist trap in Little Italy. 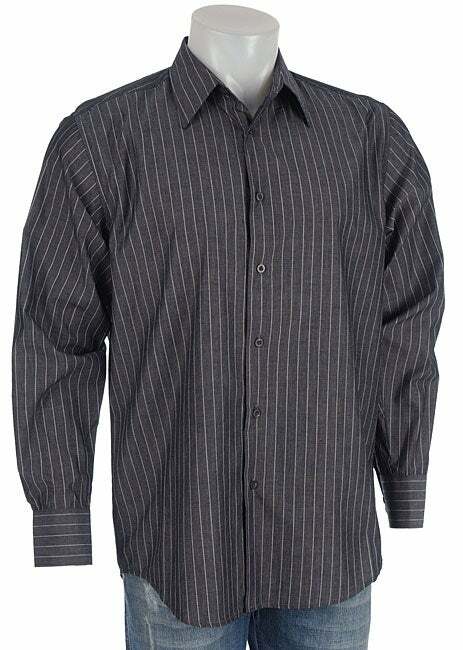 We’re being polite and calling this a “chalk stripe shirt,” but what this really is is the dreaded, heinous “going-out shirt” guys used to wear in the early 2000s rearing its ugly head again. Shirts with French cuffs and banker’s collars. Thankfully, both the French cuff and the banker’s collar are artfully paired here in one awful shirt to illustrate two points in one go. We’re not sure exactly when either of these styles ventured into the realm of used-car salesman territory, but they’re there, and there’s no going back. We don’t make the rules; we just beg you to follow them. So please, burn this shirt. We shouldn’t have to tell you this, but we do. Wide ties are out of style. And look, a banker’s collar. How awful. Every Wall Street dad will inevitably get this as a gift from one of his less creative kids. It’s a nice gesture, but put them away somewhere near your kids’ art projects and wear some more interesting cufflinks. Ah, yes, the Ferragamo tie. The tie for guys with no taste in ties. It’s almost as if these ties are given to bankers in their Wall Street starter packet along with a copy of “Liar’s Poker” and some Friday dress socks. Unless you’re wearing this because your RA told you to, there’s no reason to wear these. They’re for kids. There was a time when the Gucci bit loafer was a symbol of status on Wall Street. No one below, say, a managing director could rock a pair without getting abused. But that’s no longer the case. Men’s dress-shoe wear has gone for a sleeker, leaner look, and the Gucci bit loafer looks like the Budweiser Clydesdale of shoes.